Many foods and drinks are acquired tastes. Think back to the first time you tried coffee, gin, rhubarb, bleu cheese, single malt whisky, grapefruit, … What did you think? Chances are you didn’t like it very much. Maybe you still don’t, but over time many people come to enjoy, even crave, one or more of these challenging tastes. In the beer world there are a number of styles that cause your face to contort in a kind of “ew yuck” sort of way the first time you try them, but with some persistence you can come to love these types of beer. If you look back at my post “The top 20 beers in the world according to the experts” you won’t find any Czech Pilsners or American Wheat Ales. All of the beers in this list have big flavor profiles and most wouldn’t be very appealing for someone trying to transition from Miller High Life to the world of craft beer. The most familiar acquired taste in the beer world is the bitterness exemplified by American IPAs. If you’ve mastered IPAs and your palate is looking for a new challenge you should consider diving into the world of sour beers. The genesis for this post came when my friend Chris Hess sent me a link to a story on NPR entitled “Pucker up America: Beers are Going Sour”. If you want to read well crafted, concise, professional journalism on a beer style that is not well known in the US head on over to NPR. If you prefer getting your news from an amateur who works without an editor and is prone to going off on tangents, keep reading. I promise no future pledge drives to support this site. Let’s start by considering why foods and beverages taste sour. Here I’m going to quote directly from the opening paragraph of my own book Chemistry: The Central Science (available over on Amazon if you don’t already own a copy). So simply put sour beers are sour because they are more acidic than other beers. Being a chemist this immediately made me wonder how much more acidic in terms of pH? Based on some shoddy internet research I can report that most beers have a pH that ranges from 4.0 to 4.5. Maybe I’ll do some of my own measurements, but that sounds reasonable to me. I then found this very cool website, Embrace the Funk, where they have taken pH readings on a pretty large number of sour beers. Nearly all of the sour beers on this list have pH values between 3 and 4, going as low as 3.1. Now you may be thinking that going from 4 to 3 doesn’t sound very dramatic, but because pH is a logarithmic scale, a beer with a pH of 3 is ten times more acidic than one with a pH of 4. Consider the pH values of other familiar liquids: pure water (pH = 7.0), black coffee (pH = 5.0), wine (pH = 3.5), coca cola (pH = 2.8), vinegar (pH = 2−3), and 1.0 M hydrochloric acid (pH = 0.0). Where does the extra acid in a sour beer come from, and what kind of acid is it? Acids are naturally produced in the fermentation process, which is why all types of beers are naturally acidic, but as we’ve seen sour beers are more acidic than normal. The extra acidity in a sour beer comes from the work of bacteria in the fermentation process. Let’s meet the germs responsible for the uniqueness of sour beers. Lactobacillus – During fermentation the bacteria lactobacillus produces the lactic acid (C3H6O3, shown below) that is the key souring ingredient in sour ales like Berliner Weiss and Lambics. That’s right the same acid that makes your muscles ache when you spontaneously decide to go for a 10 mile bike ride is also responsible for the tart taste of a good Berliner Weiss. 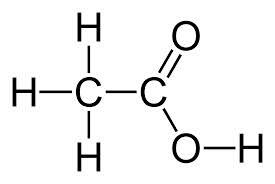 Lactic acid, the molecule largely responsible for making sour beers sour. Pediococcus – Another lactic acid producing bacteria closely related to lactobacillus. As any good German knows, pediococcus is the bacteria responsible for the fermentation needed to turn cabbage into sauerkraut. 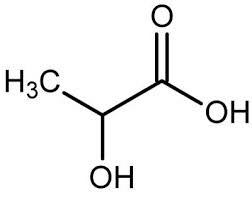 In addition to making lactic acid, pediococcus also produces some diacetyl (shown below), a chemical that gives beer a buttery taste. Even in sour beers this flavor is undesirable. To combat this pediococcus is used in combination with brettanomyces yeast (who we will meet later), which consumes the diacetyl. 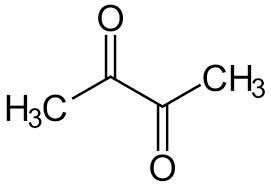 Diacetyl, the molecule responsible for the buttery taste in beer. Acetobacter – This is a bacteria that in the presence of oxygen can convert ethanol to acetic acid (CH3COOH, shown below). It is used commercially on a large scale to make vinegar. Not all sour beers used acetobacter, but the acetic acid it produces is a key ingredient in Flander’s Red Ales and Oud Bruins. Acetic acid, the main component of vinegar. Brettanomyces (aka Brett) – Brett is a yeast rather than a bacteria. It is a slow growing strain of yeast that likes to grow in oak wood. Unlike most brewing yeasts that can only ferment simple sugars, Brett is able to metabolize more complex sugars like maltose. On its own it does not produce the acids that make beers über sour, but it is used in the brewing of many sour beers. In my opinion the words used to describe the taste/aroma profile that Brett produces don’t do justice to the sensory experience of drinking a Brett forward beer. Common descriptors include barnyard, horse blanket, wet straw, earthy, leathery, and my favorite “wet dog in a phone booth”. The only way to really understand what Brett does to a beer is to taste a Belgian Pale Ale where Brett is the star player, like Orval, Tank 7 by Boulevard, Matlilda by Goose Island, Seizoen Bretta by Logsdon, or Rare Vos by Ommegang. Note that none of these beers is classified as a sour beer. To get the sour taste we need to throw in some of the bacteria described above. Most brewers steer clear of wild yeasts, like brettanomyces, and bacteria, like lactobacillus and pediococcus. Not only are these bacteria not used when brewing most styles of beer, great pains are taken to keep them as far away as possible because given the opportunity they can easily contaminate the brewery or the tap lines at the local pub leading to infected beer with unwanted sour funkiness and/or buttery flavors. Nobody wants their Vienna lager or IPA tasting like a wet dog. The way the brewers introduce these bacteria during the brewing process is one of the most interesting parts of the sour beer story. Some styles, particularly lambics, are spontaneously fermented. By that I mean the brewers cool down the wort and leave it outside overnight for the necessary yeast and bacteria in the air to waft into the liquid. Lambics are made in the Senne river valley of Belgium which is renowned for having just the right mix of microbes floating around in the air. 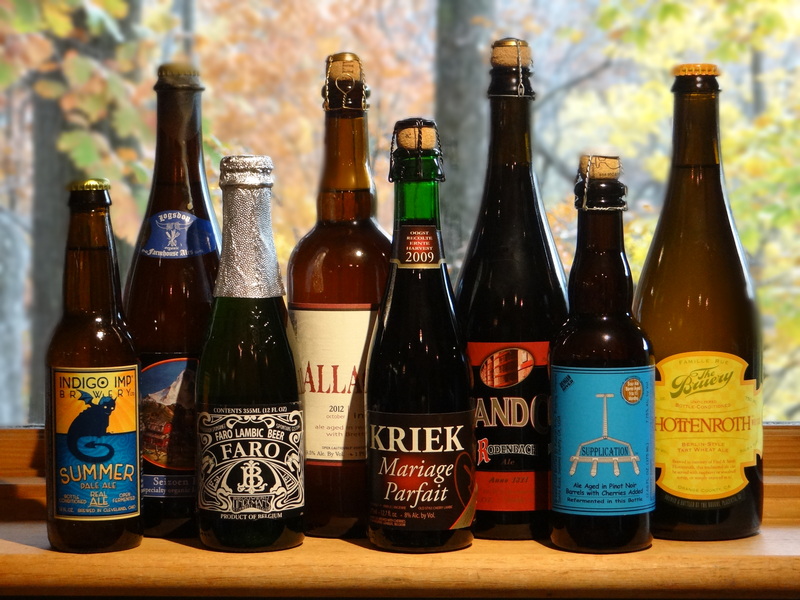 Famous Lambic brewers include Cantillon, Boon, 3 Fonteinen, and Lindemans. Not all spontaneously fermented beers come from the Senne valley though, and a few US brewers have become quite skilled at the arcane process of spontaneous fermentation. The entire Coolship line of beers from Allagash (Portland, Maine) are spontaneously fermented. Jolly Pumpkin (Dexter, Michigan), De Garde (Tillamook, Oregon) and Indigo Imp (Cleveland, Ohio) make extensive use of spontaneous fermentation. It’s important to note that while the wild yeasts and bacteria described above are necessary to make sour beers, not all sour beers are spontaneously fermented. For more information on that distinction see the post by Christopher Barnes on this question. The combination of sour and bitter is too much of an assault even for the seasoned palate, so the hops used in sour beers are usually aged for a couple of years until they contribute very little in the way of bitterness or aroma. Likewise the malts are meant to support the sour flavors not dominate the beer, so many, but not all, styles of sour beers are made with a reasonable portion of wheat added in the malt bill. Finally, as the beer becomes more acidic the fermentation process slows way down, which means it takes a long time, months or even years, to brew a sour beer. As a result they tend to more expensive than other styles. They also tend to have relatively low alcohol content. Just the kind of combination I was looking for in college—low alcohol and high price. Lambic – Like champagne a true lambic must be made in a specific place, namely the Senne valley near Brussels. Traditionally inoculated with wild yeast and bacteria using spontaneous fermentation, and then aged in oak barrels. Lambics can be among the sourest and funkiest of beers. Gueuze – A blend of young and old lambics. Typically drier, fruitier and more intense than an unblended lambic. Fruit Lambic – A beer made by adding fruit to a lambic after spontaneous fermentation has begun. Faro – This uncommon style is made by adding sugar to a lambic to balance the sourness. It’s something of a desert beer. Berliner Weiss – A German wheat beer that uses lactobacillus to make a tart summertime thirst quencher. It’s not uncommon in Berlin to add a dash of sweet colored syrup to balance out the tartness. Gose – Another German wheat beer made with lactobacillus, Gose originated near Leipzig in eastern Germany. Gose differs from Berliner Weiss by the addition of coriander seed and salt. Flanders Red – A burgandy red sour ale from the north of Belgium that combines fruity and tart flavors, oak barrel aging, and often a touch of malted vinegar. Rodenbach Grand Cru is the classic example of this style. Flanders Oud Bruin – This somewhat mellower cousin of Flanders Red is darker in color (brown instead of red) with a more malt character and a softer acidity. American Wild Ale – Inspired by the sour beers of the old world, American Wild Ales are fermented by North American wild yeasts which produce their own styles of funkiness. In the coming posts I’ll describe and review some examples of each style so you can chart your entry into the world of sour beer.